The Min Min lights of Australia is one of my most requested videos. And it is a very interesting mystery. One of the first famous sightings coming from white settlers happened in 1918 when a stock man noticed some very strange lights in the distance. And this sighting happened in a small settlement known as Min Min and ever since then these strange lights have been known as the Min Min lights. But the first recorded sighting from westerners happened in 1838 according to the book six months in South Australia. Now there are so many sightings of these mysterious lights each and every year making this phenomena very famous world wide. And even some scientist claim that they know what is causing this and we will get into that a bit later. According to eye witness accounts these lights will approach or follow you while on foot or driving. And if you shoot at them they will disappear but only for a little while as they are known to return. And it is also believed that if you follow them you will just vanish and never be seen again. And when people come face to face with these lights they get struck with fear, they are known to bring even the bravest of men to tears. Now these lights are not just seen in Min Min they are also seen and reported all throughout Australia. But most of the sightings do seem to happen in or around the state of Queensland. And these sightings do vary as many say that they had seen the Min Min lights but they were nothing more than dim lights upon the horizon. Some say that they too had seen these lights but they weren’t dim at all, they were extremely bright and they would also change in color from white to green to blue to red just basically any color one could imagine. 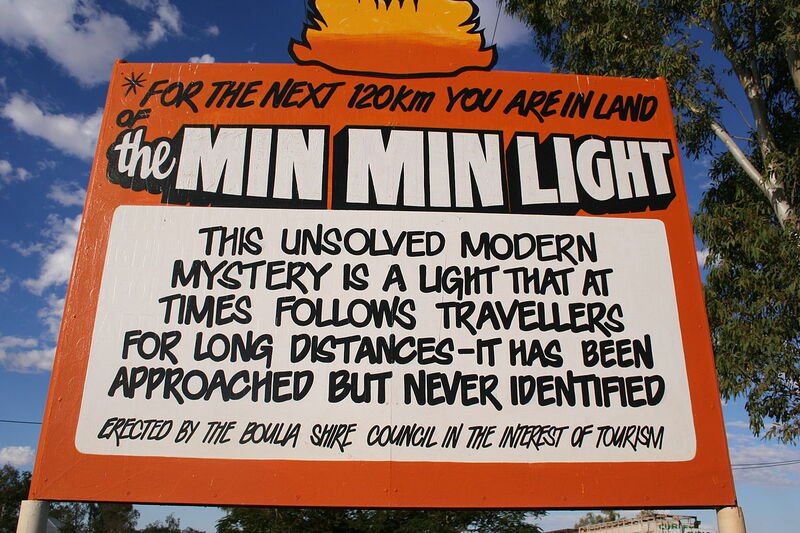 And some of these sightings or encounters I should say are extremely terrifying as some claim that while they were driving through the outback these lights would approach them either from the front or the back and they would follow them. Sometimes for miles just scaring the crap out of these people. Making some believe that they must be some sort of extraterrestrial or unknown craft as it does seem that they are being controlled by something intelligent. One sighting comes from Ms. Hammond a local women who had heard stories about the Min Min lights her whole life but had never actually seen them. Until one day when she and her husband John decided to go camping in western Queensland. One night they were on a very remote cattle ranch when they saw a very odd greenish light moving up and down. It was really close to them, it couldn’t have been more than a mile away and it appeared to hover just slightly off the ground. And this green light just moved very strangely. Ms. Hammon stated that it was silent and very eerie they had never seen anything like it before and it kind of freaked them out. And they just stood there starting at this mysterious light until it finally disappeared. And the next day John went to that location to see if he could find any clues, but there was nothing there and they both came to the conclusion that it must have been the Min Min lights. Another encounter happened when a man was riding is horse back to camp one night when all a sudden he saw a very bright light appear out of nowhere. And this light was so bright that his horse started to tremble. And as this mysterious light was getting closer and closer he realized that it was only about 3 or 4 feet off the ground, So he thought that it must be a car with its high beams on. But then this extremely bright light started to move very, very fast. He now knew that there was just know way that this light was from a vehicle or anything man made for that matter. Then it got behind him and this man really started to freak out as he believed that it was following him. And just before this light was about to pass him it split into two. Then they just disappeared back into the darkness of the night. And when this man finally made it back to camp he told everybody about what he had just encountered. This man was terrified, he wanted some answers as he had never seen anything like this before. And he lived within this region his whole life. And he strongly believed that there was some sort of intelligence behind them. They way they moved and acted was just not natural. 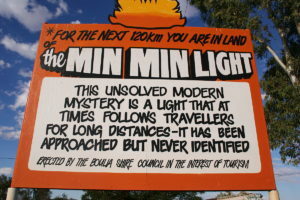 Now there are many different type of sightings of the Min Min lights and a Professor from the university of Queensland Jack Pettigrew has also claimed to have seen these lights on several occasions. And after doing a lot of research and testing he believes that the Min Min lights are nothing more than an optical illusion that can occur when the ground is really, really cold. And when these type of conditions are perfect any light source natural or man made can be seen for hundreds of miles. And I do believe that this can explain some of these sightings as this theory does appear to be sound. But I don’t think that this can explain all of them. I don’t think that an optical illusion can explain some of these eye witness accounts. Such as when these lights follow people up close and personal. In order for this optical illusion to work there has to be some sort of distance. And many people claim that these lights were right there, right in front of them moving as if something intelligent was behind it. Then they disappear, reappear, split into two, three or four. And many eye witnesses even claim that these lights also changed in color. And to me that kind of sounds like UFO activity, not an optical illusion. So the Min Min lights could be several different things from an optical illusions to UFO’s and maybe even some sort of unknown natural phenomena. Now I made a video a little while a go that talked about ghost lights or spook lights. And these mysterious lights are constantly seen in certain locations throughout the world. And they appear to be some sort of unknown natural phenomena. So before making this video I thought the Min Min lights were going to be another ghost light. But after researching these sightings I don’t think they are. I think they are something else entirely in regards to the actual up close and personal sightings. 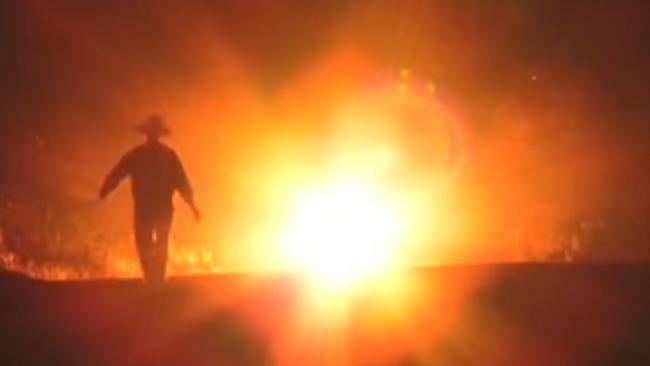 And I am sure that if I was all alone in the middle of nowhere driving through the outback when all a sudden I was approached and followed by some strange and mysterious lights I too would be scared out of my mind. Making this another very disturbing mystery that I hope never to encounter.